Field of Screams says it has earned the title of “America’s #1 Haunted Attraction”. If you love to be scared, shocked, even terrified, then Field of Screams may be for you. Non-stop heart-pounding action that will leave you begging for the end to be near. As an alternative attraction for children, Schopf Bros. Farms has created Corn Cob Acres just for kids. This attraction includes 40 fun farm activities, including hayrides, pedal karts, barrel train rides, face painting, slides, and more! Field of Screams is open most Fridays, Saturdays, and Sundays in September, October, and November. Please check their online schedule to verify dates, hours, and general policies. If you purchase your Field of Screams tickets online, you will also receive free access to their Field of Screams Entertainment Area. Here you’ll find something new each night, such as live bands and special events. 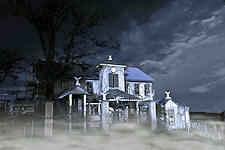 Field of Screams is located in Lancaster, PA, roughly an hour from Baltimore and Philadelphia. For those who love to be scared, this is your place. You’ll find driving directions here. Below are some attractions and points of interest near Field of Screams. These listings may be paid or sponsored.